First of all, what is build root? 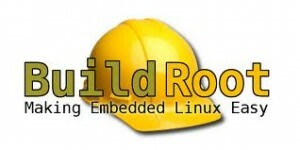 "Buildroot is a set of Makefiles and patches that makes it easy to generate a complete embedded Linux system. Buildroot can generate any or all of a cross-compilation toolchain, a root filesystem, a kernel image and a bootloader image. Buildroot is useful mainly for people working with small or embedded systems, using various CPU architectures (x86, ARM, MIPS, PowerPC, etc.) : it automates the building process of your embedded system and eases the cross-compilation process." "Buildroot is maintained by Peter Korsgaard, and licensed under the GNU GENERAL PUBLIC LICENSE V2 (Or later). Stable releases are delivered every three months." You don't have to build all the scripts to startup a linux system. Buildroot will do the work for you. Buildroot installs a cross compilation toolchain, so you can compile your system using your desktop PC and so you can gain a lot of time. For example, the compiling process of a complete system on a Raspberry Pi can take several weeks, instead on your PC it will take few hours. You may be missing some build dependancies (flex, bison, etc…) but you will be warned about what packages you need to install if this is the case. Change to your SDK directory and and start the build (this can take a few hours the first time). Now place the SD card in your Raspberry Pi and power on. If everything went as planned, you should get a login prompt for Bsquask (linux). The first step were followed, but got lost in the last..stage. pls a little explanation on these steps. waht is going wrong? have you any errors from the command line? I followed instructions and compliled fine, now I want to access RPI via ssh (no other choises). how can I set static ip? it's not like Raspbian, I didnt's found the file /etc/network/interface. @makouda have you found how to connect via ssh ?